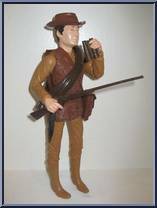 This series is the only time this figure was released Body: Carmel, closed hands, same head sculpt as Daniel Boone, body sculpt of Sheriff Garrett. Accessories: Soft medium brown, hard dark brown. 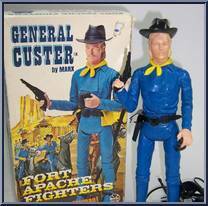 Body: Steel blue, first issue had shoulder loops, then was issued with pins/rivets, closed hands. Accessories: Yellow scarf & gloves, soft & hard black. 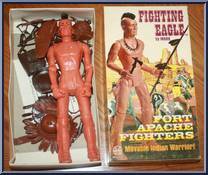 Box: Fort Apache Fighters, plain Mailer. . . Body: Flesh tone body, closed hands, shoulder pins. Accessories: Soft medium brown, hard dark brown. Body: Royal blue, closed hands, 1st issued with no rivets (closed shoulders), then reissued with pins/rivets. Accessories: Yellow scarf & gloves, soft & hard black. 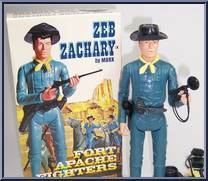 Box: Fort Apache Fighters, . . . Body: Cream body, closed hands, shoulder loops then, with pins in shoulders. 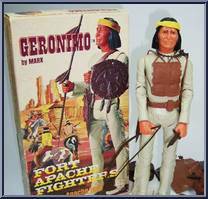 Accessories: Yellow headband, Soft medium brown, hard dark brown Box: Fort Apache Fighers color, plain mailer 'Fort Apache . . . 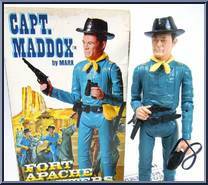 This series is the only time this figure was released Body: Steele blue, closed hands, shoulder loops, black hair. Accessories: Yellow scarf & gloves, soft & hard black.